Hugh Plumb started on the pole in the No. 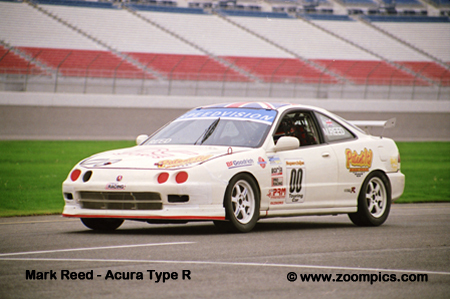 43 RealTime Acura Integra Type R. At the outset he was passed by TC Kline teammates Mike Fitzgerald and Neil Sapp. On lap-14 Alfred duPont challenged Fitzgerald for the lead and the pair slid wide. This allowed Plumb to take the lead and win the race by a margin of 1.326-seconds – his second victory of the season. Alfred duPont was able to capitalize on the momentum of his first World Challenge Touring win at Laguna Seca. DuPont started seventh in his European Racing Technologies BMW 328is and contended for the lead until contact relegated him to a second place finish. During the event, he set the fastest race lap. Neal Sapp qualified fourth but followed teammate Fitzgerald at the start and found himself running second for much of the event. He was passed by Alfred duPont and despite a number of attempts, he was unable to pass him and finished third. This was enough for Sapp to clinch the 'Rookie of the Year' award. He would also win the season finale at San Diego. 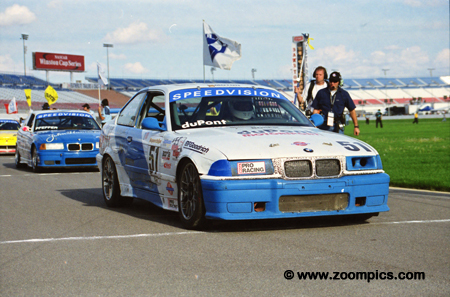 Will Turner qualified third in the Turner Motorsports BMW 328is and was racing with the lead group until he made contact with Alfred duPont. After the spin, Turner fell to twenty-ninth but was able to work his way up to fourth at the finish. His efforts earned him the Borla Performance Award - given to the driver who delivers the drive of the day. In the last half of the season, Mike Fitzgerald was one of the hottest drivers. At the Road Atlanta, he became the first driver in World Challenge history to win GT and Touring races on the same weekend. This did not go unnoticed by the competition and in the final races of the series he appeared to get beat up on a regular basis – Las Vegas was no exception - he retired with a broken oil cooler. It was an eventful race for series point’s leader Pierre Klienubing. 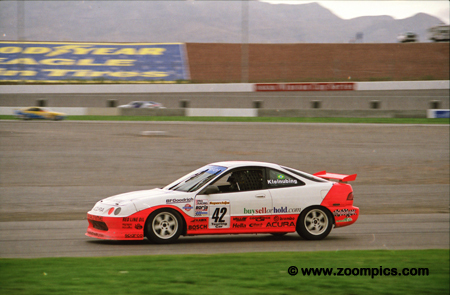 He qualified the RealTime Acura Integra Type R sixth and finished fourth. Going into the finale at San Diego there was a mathematical chance that he could lose the championship to rookie Neal Sapp. Despite winning the final round, Sapp finished 11-points behind Klienubing in the Touring Car Championship standings. Nick Vitucci gets a lot of air in Las Vegas’ turn one chicane. 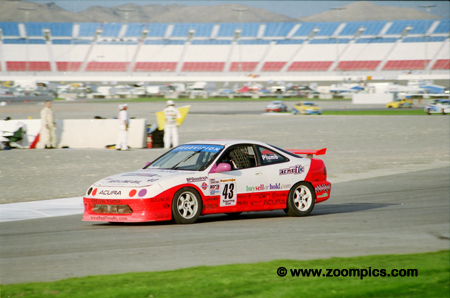 The Acura Integra Type R driver entered the final three races of the season - Laguna Seca, Las Vegas and San Diego. 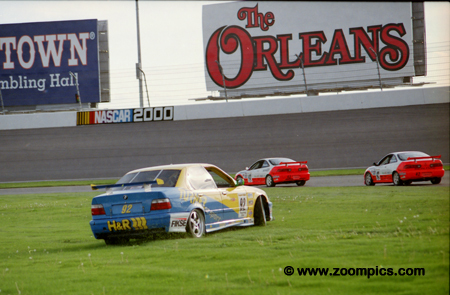 At Las Vegas he qualified towards the back of the grid and a crash on lap-16 left him well down the finishing order. 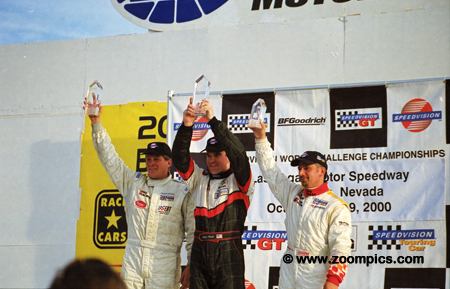 Steve Pfeffer was the teammate of 2000 World Challenge GT Champion Jeff McMillin. 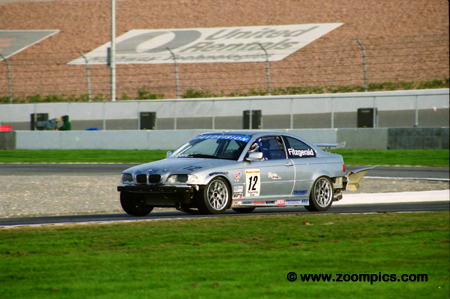 Previously they raced together on the Franz Blam Racing team in the Motorola Cup series. 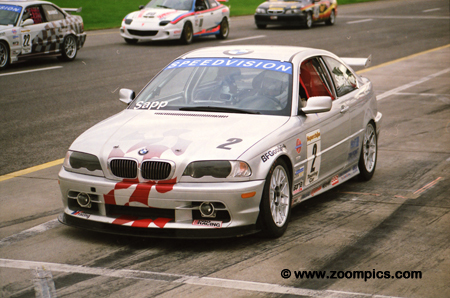 Driving a BMW 328is in the Touring division Pfeffer had several good runs during the 2000 season. 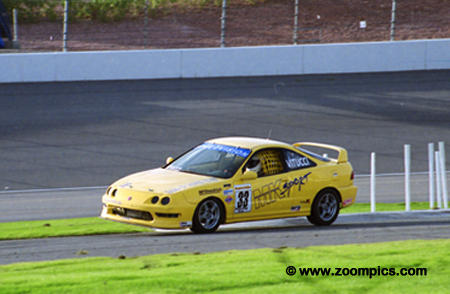 With six top-tens during the year he, finished eighth in the overall standings and fourth in the rookie battle. 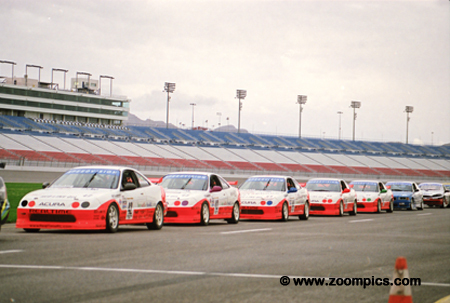 The RealTime fleet of Acuras line up for practice at Las Vegas. 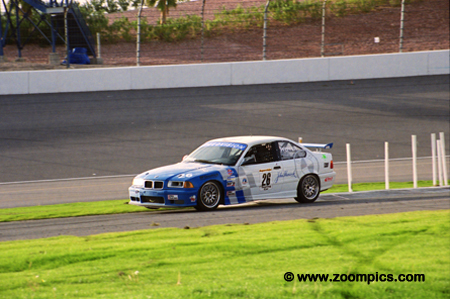 At this event, the team drivers included Pierre Kleinubing, Hugh Plumb, Kevin Schrantz, Carlos Steyer and Fred Meyer. Kleinubing would take the World Challenge Touring Championship (with three wins, two seconds, two thirds, five poles and eight top-five finishes) and the RealTime team was awarded 'Crew of the Year'. The Las Vegas World Challenge Touring Car podium. Hugh Plumb in the center is celebrating his second win of the season. To Plumb’s left is runner-up Neil Sapp. Third place finisher Alfred duPont rounds out the podium.